The monk Anchin was young in years but old in scholarship. Every day for many hours he read the Great Books of the Good Law and never wearied, and hard characters were not hard to him. The monk Anchin was young in years but old in holiness; he kept his body under by fastings and watchings and long prayers. He was acquainted with the blessedness of sublime meditations. His countenance was white as ivory and as smooth; his eyes were deep as a brown pool in autumn; his smile was that of a Buddha; his voice was like an angel’s. He dwelt with a score of holy men in a monastery of the mountains, where he learned the mystic “Way of the Gods.” He was bound to his order by the strictest vows, but was content, rejoicing in the shade of the great pine trees and the sound of the running water of the streams. So the monk Anchin made him ready. “I will remember,” said the monk, and so he set forth upon his way. The monk smiled. “Sweet and happy bird,” he said. When the monk Anchin came to the great plain, the sun was high in the heavens, and all the blue and golden flowers of the plain languished in the noon-tide heat. The monk likewise became very weary, and when he beheld the Marshy Mere, where were bulrush and sedge that cooledtheir feet in the water, he laid him down to rest under a sycamore tree that grew by the Marshy Mere. Over the mere and upon the farther side of it there hung a glittering haze. Long did the monk Anchin lie; and as he lay he looked through the glittering haze, and as he looked the haze quivered and moved and grew and gathered upon the farther side of the mere. At the last it drew into a slender column of vapour, and out of the vapour there came forth a very dazzling lady. She wore a robe of green and gold, interwoven, and golden sandals on her slender feet. In her hands were jewels—in each hand one bright jewel like a star. Her hair was tied with a braid of scarlet, and she had a crown of scarlet flowers. She came, skirting the Marshy Mere. She came, gliding in and out of the bulrush and the sedge. In the silence there could be heard the rustle of her green skirt upon the green grass. The monk Anchin stumbled to his feet and, trembling, he leaned against the sycamore tree. Nearer and nearer came the lady, till she stood before Anchin and looked into his eyes. With the jewel that was in her right hand she touched his forehead and his lips. With the jewel that was in her left hand she touched his rice-straw hat and his staff and his rosary and his begging bowl. After this she had him safe in thrall. Then the wind blew a tress of her hair across his face, and when he felt it he gave one sob. For the rest of his journey the monk went as a man in a dream. Once a rich traveller riding on horseback threw a silver coin into Anchin’s begging bowl; once a woman gave him a piece of cake made of millet; and once a little boy knelt down and tied the fastening of his sandal that had become loose. But each time the monk passed on without a word, for he forgot to commend the souls of these compassionate ones for the space of nine existences. In the tree-tops the Wise Birds of Buddha sang for him no more, only from the thicket was heard the cry of the Hototogisu, the bird lovelorn and forsaken. Nevertheless, well or ill, he performed his errand of mercy and returned to the monastery by another way. Howbeit, sweet peace left him from the hour in which he had seen the lady of the Marshy Mere. The Great Books of the Good Law sufficed him no longer; no more was he acquainted with the blessedness of divine meditations. His heart was hot within him; his eyes burned and his soul longed after the lady of the green and golden robe. At length Anchin went to the good Abbot, and in his ear poured forth all his tale in a passion of mingled love and grief, humbly asking what he must do. “Are you angry with me?” said Anchin. So Anchin fasted and prayed, he scourged his body, and hour after hour he did penance in the ice-cold water of the torrent. Wan as a ghost he grew, and his eyes were like flames. His trouble would not leave him. A battle raged in his breast. He could not be faithful to his vows and faithful to his love. Now on a hot night of summer, the monk being sleepless in his cell, he was visited by Kiohimé, the magic lady of the mere. The moonlight was on her hands and her long sleeves. Her robe was green and gold, interwoven; golden were her sandals. Her hair was braided with scarlet and adorned with scarlet flowers. She smiled, “May not?” she said, and with that she lifted the monk Anchin in her arms. But he, gathering all his strength together, tore himself from her and fled from the place. Barefooted and bareheaded he went, his white robe flying, through the dark halls of the monastery, where the air was heavy with incense and sweet with prayers, where the golden Amida rested upon her lotus, ineffably smiling. He leaped the grey stone steps that led down from her shrine and gained the pine trees and the mountain path. Down, down he fled on the rough way, the nymph Kiohimé pursuing. As for her, her feet never touched the ground, and she spread her green sleeves like wings. 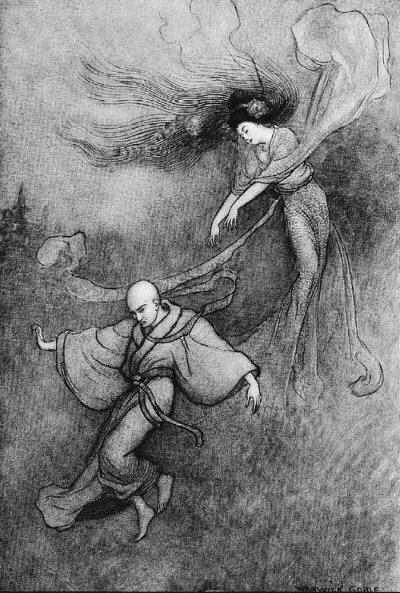 Down, down they fled together, and so close was she behind him that the monk felt her breath upon his neck. “As a young goddess, she is fleet of foot ...” he moaned. At last they came to the famed temple of Dōjōji, which was upon the plains. By this Anchin sobbed and staggered as he ran; his knees failed him and his head swam. “I am lost,” he cried, “for a hundred existences.” But with that he saw the great temple bell of Dōjōji that hung but a little way from the ground. He cast himself down and crept beneath it, and so deemed himself sheltered and secure. Then came Kiohimé, the Merciless Lady, and the moonlight shone upon her long sleeves. She did not sigh, nor cry, nor call upon her love. She stood still for a little space and smiled. Then lightly she sprang to the top of the great bronze bell of Dōjōji, and with her sharp teeth she bit through the ropes that held it, so that the bell came to the ground and the monk was a prisoner. And Kiohimé embraced the bell with her arms. She crept about it, she crawled about it and her green robe flowed over it. Her green robe glittered with a thousand golden scales; long flames burst from her lips and from her eyes; a huge and fearsome Dragon, she wound and coiled herself about the bell of Dōjōji. With her Dragon’s tail she lashed the bell, and lashed it till its bronze was red hot. Still she lashed the bell, while the monk called piteously for mercy. And when he was very quiet she did not stop. All the night long the frogs sang by the Marshy Mere and the wind sighed in the sedges. But the Dragon Lady was upon the bell of Dōjōji, and she lashed it furiously with her tail till dawn. Add The Bell of the Dojoji to your own personal library.